HTC announced the HTC Flyer tablet. With a 1.4 Ghz (? eventually 1.5Ghz) single-core CPU, a 7 inch screen with 1024*600 resolution, it's not as breathtaking as everyone hoped. Photo © by HTC. All rights reserved. In fact, it also comes with Gingerbread. No problem with that. But for a tablet aiming Q2/2011, it should be Honeycomb, no matter what. And guess what? The Sense UI is to be blamed again for that. HTC didn't have enough time to put their Sense on the device. Interesting that Gingerbread again gets the 2.4 version number marking. First a HSPA+ version will be available, followed by Wifi-only version later. The remarkable thing is the stylus. Yes, you can use the tablet with stylus too, if you like. You don't have to use this, it's a capacitive screen. The pen is the magic. Front-facing camera with 1.3MP and a rear camera with 5MP is also pretty average. BARCELONA, SPAIN – Mobile World Congress – February 15, 2011 – HTC, a global leader in mobile innovation and design, today announced its first tablet, the HTC FlyerTM. HTC Flyer blends HTC’s trademark design language with an all-new HTC Sense user experience that has been reimagined for the tablets. 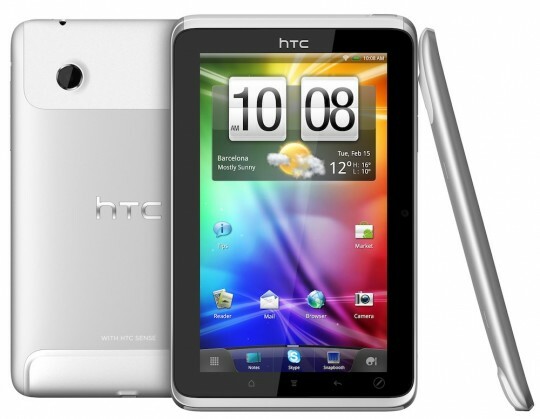 Using an intuitive and innovative approach to tablets, HTC Flyer combines natural touch and pen interaction. HTC also announced HTC Watch, a new connected video service that will debut on HTC Flyer tablet, and will collaborate with OnLive Inc. to launch the first cloud-based mobile gaming service on a tablet. HTC Scribe Technology on the HTC Flyer tablet transforms traditional note-taking into smart note-taking by integrating natural onscreen writing with thoughtful and integrated innovations. A feature called Timemark enables you to capture the audio of a meeting in line with your written notes, so tapping on a word in your notes instantly takes you to that exact place in time in the audio recording of the meeting. Notes are also integrated with the calendar so when there is an appointment reminder you are automatically prompted with an opportunity to begin a new note or in the case of recurring meetings, to continue where the last meeting left off. In an industry first, the HTC Flyer tablet also features built-in synchronization with Evernote, the world-leading notes application and service. HTC takes mobile gaming to an entirely new level by being the first mobile device in the world to integrate OnLive Inc.’s revolutionary cloud-based gaming service. OnLive is leading in the home gaming market by letting people play top video games on their televisions without the need to buy expensive gaming hardware or software. When integrated fully, the OnLive service will enable customers to pipe the OnLive service through the HTC Flyer tablet’s broadband wireless to their television sets, or let them play directly on the tablet. When integrated on the HTC Flyer tablet, people can play a variety of games, including hits like Assassin’s Creed II, NBA 2K11 and Lego Batman.